I love to swim and we thought that finding a charity that helps people through swimming would be the ideal match for a Mizvah Project and beyond. Shalva has so many wonderful programs and felt like the perfect choice. 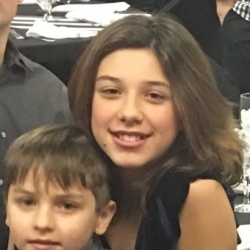 Please help me help Shalva! Thank you so much. Marty & Betty Strauss & Berman 118 USD Dear Aliya...we are so proud of you for your choice of SHALVA as your Mitzvah project...just wonderful...we'll be with you very soon to celebrate...Loving you !! Mark Cohn 36 USD Mazal tov to you Aliya! Wishing you a wonderful time with your celebration! Yishar koach - may you go on in strength! CAROL RUTTENCUTTER 75 USD I look forward to meeting you, I'm coming with Robin, and I'm looking forward to sharing your Bat Mitzvah. Robin Kidder 75 USD Mazel Tov Alyia!!! Looking forward to seeing you and hearing you read the Torah! Joanna Muenz 36 USD What a terrific project! Nancy and Chris Pazienza 25 USD Congratulations and Buona Fortuna! Sam Hilt 36 USD With warmest wishes! Susanna Myers 72 USD What a well chosen, thoughtful project. Congratulations Aliya! Robert Levy 36 USD A great chance to share your "simcha." Leonard Robbins 56 USD I'm sure you know how much the three of us appreciate your choice to support inclusion of people with disabilities. Mazel tov. Marsha Strauss 36 USD Mazal tov on your upcoming bat mitzvah and on stepping up and wanting to bring awareness and help to an organization doing good work for kids with special needs. Sending love and pride and counting down! Rabbi Leigh Lerner 36 USD Looking forward to your Bat Mitzvah and sending compliments on a mitzvah project well-chosen. Devorah Block 25 USD This is a great project, Aliya! Sharon Strauss 18 USD Aliya we love you and are so proud of you. We look forward to a long relationship between our family and Shalva.